Clerys O'Connell Street re-opens after months of refurbishments due to flash flooding. 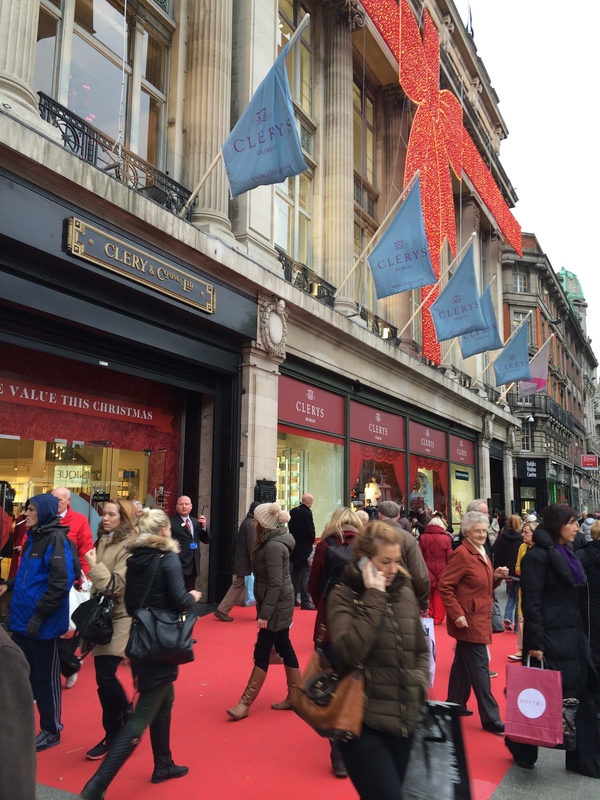 Hundreds of happy customers turned out in the freezing cold this morning to see the re-opening of Clerys on Dublin’s O’Connell Street. The department store, which is one of the oldest of its kind in Europe, closed suddenly last July when flash flooding caused millions of euro in damage. Minister for Arts, Heritage and the Gaeltacht Jimmy Deenihan re-opened the 160-year old retail emporium to a large crowd, who had waited in anticipation all morning to catch a glimpse of the renovations. Anne O’Grady, 74 from Coolock in Dublin said “I am delighted to see it re-opening. Myself and my friends used to come into Clerys every Friday and do a bit of shopping, I really missed it while it was closed”. Shelly Casey, 63 from Dublin City said “I really love the new look. I am a big fan of Clerys and always have been. I really would have been lost doing my Christmas shopping without it”. The store re-opened just in time for the Christmas season, which will come as a delight to its 86 staff who were temporarily laid off while the shop was closed. Together with the 86 returning staff there has also been further employment with new brands like Fuse Fashion which offers a range of different dresses, being welcomed to the new store. Clerys is offering up to 50% on many of its brands for this weekend only, which is sure to gather a large crowd to the department store over the coming days. Colin Farrell: TV Crime Boss?